Babies and binkies go together like peanut butter and jelly. Okay, maybe not always, but hey–if you’re lucky enough to have a little one who finds comfort in a pacifier, you know the love-hate relationship that can develop between you and the easily-misplaced essential item. For those of us who must never leave home without a pacifier, the invention of the pacifier clip is a blessing. 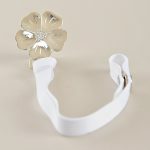 And even better, the selection is always improving, a fact that makes accessorizing baby’s christening outfit much more pleasant. No longer are we forced to clip garish plastic cartoon characters to delicate white family heirlooms in the name of keeping baby quiet through the ceremony! 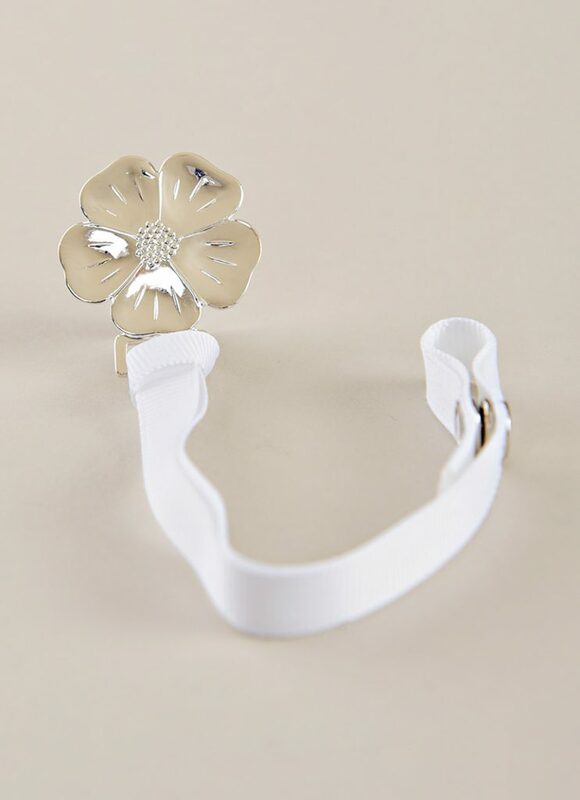 In that spirit, we’ve searched far and wide to gather a selection of silver-plated pacifier clips that add a sense of elegant personality to baby’s christening wear. 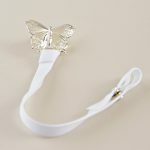 Display a token of faith with our bunny pacifier clip, dress her up with our delicate butterfly pacifier clip, accessorize any girl or boy with our classic teddy bear clip…and there are more options to choose from! 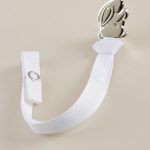 These silver-plated pacifier clips are easy to care for–each comes with a washable ribbon. With time and use, they may tarnish a bit, but a quick rub with a silver polishing cloth will make them look brand new, making them a keepsake to treasure long after the pacifier has become a thing of the past.